In 2001, Starbucks produced a little pamphlet in stores with recipes for Starbucks Christmas Blend coffee. I asked my Jocelyn to create some scans of the pamphlet, and she ended up trying a recipe (with her own twist), and creating her own blog post from the recipe pamphlet. 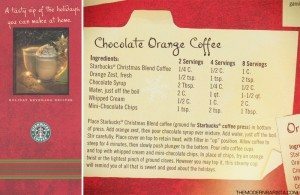 “My friend Melody asked me to scan some documents for her, and in the midst was this Starbucks recipe pamphlet from Christmas 2001. 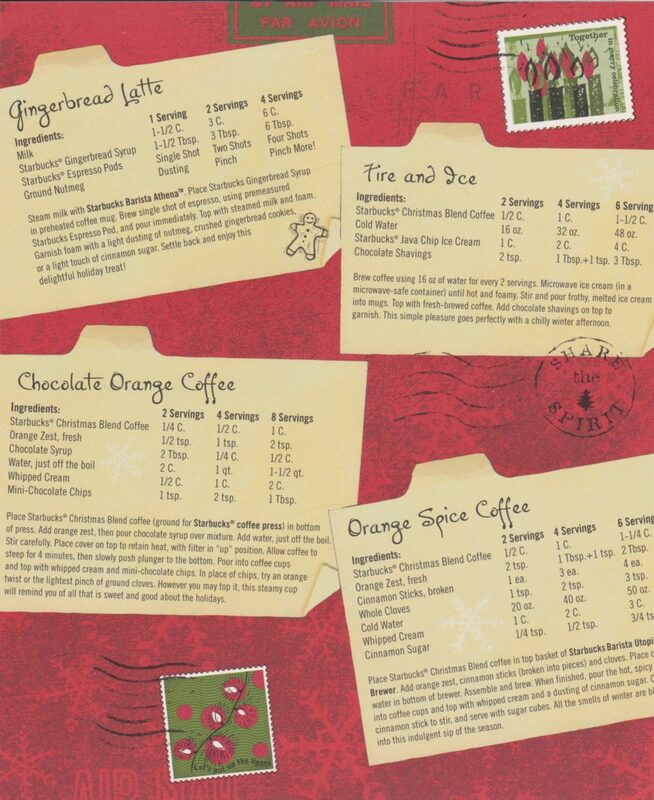 It has four recipes using Starbucks Christmas blend and Starbucks brewing equipment (which is no longer). I remember back in the day the Utopia and I still have my Barista machine. Still going strong, and I feel it might last forever. I am going to highlight some of these old recipes, and give them a little update. I’ll post the original scans below the jump so you can see this little piece of Starbucks past. There are four recipes in this pamphlet. 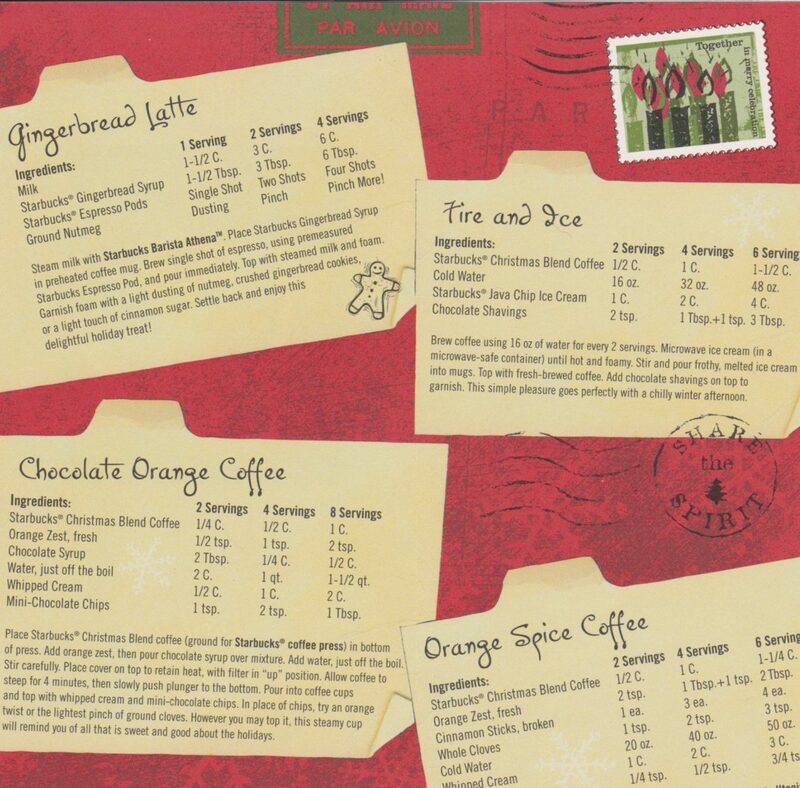 Gingerbread latte, Fire & Ice, Orange Spice Coffee and this one, Chocolate Orange coffee. I am not personally a huge fan of whipped cream on hot coffee, plus I think when made right, foam is even more delicious! I swapped out the chocolate syrup with chunks of valrhona chocolate, traded the whipped cream for thick whole milk foam, and topped with freshly grated nutmeg and orange zest. When I fist saw this recipe, I was kind of iffy towards it, I like my coffee plain and simple, but this was actually quite delicious! 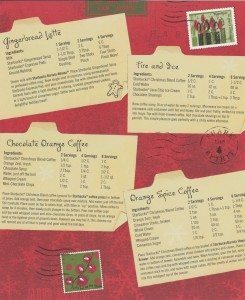 The valrhona chocolate brought a subtle sweetness to the Christmas Blend, and the orange and the nutmeg enhanced the spiciness. This was a fun drink to make, and could easily be replicated at Starbucks (without the orange)! You can find more Starbucks of yesteryear here. 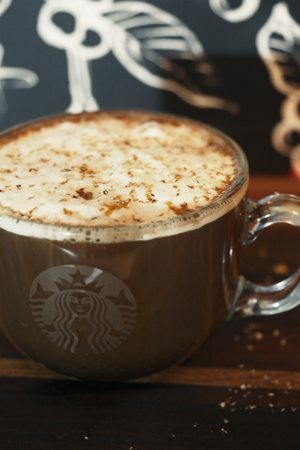 Starbucks For Life is Back! Win Starbucks For Life! Sounds nice and reminds me of those chocolate oranges at Christmas… Also makes me think of the orange spice Iced Coffee.